Have a quick question to ask us? You just might find the answer here in our most frequently asked questions. Please feel free to contact us if you still have any questions or concerns via email or message us on Facebook. I've found a litter of kittens, what do I do? I have to surrender my cats / need to help a friend rehome her cat, can you help? 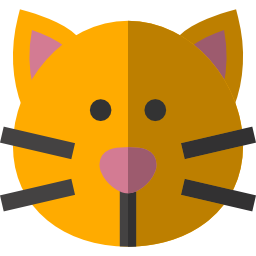 I’ve found a stray cat / have a cat hanging around my house / I think some owners have left a cat behind – What should I do? Can you help? I’d like to help by fostering, but I already have three cats at home. Can I still help with the new cat laws? Why should I buy a cat from you for $150/$200 when I just saw free kittens being given away on Facebook? Why do you name the cats? If I adopt one, am I able to change their name? Where is the shelter? Can I come and see all the cats? My cat is missing! Can you help? Unfortunately we cannot take direct surrenders. We do not have the resources or people power to offer a rehoming service. We only rescue from the pound or RSPCA; cats that are otherwise in danger of euthanasia. 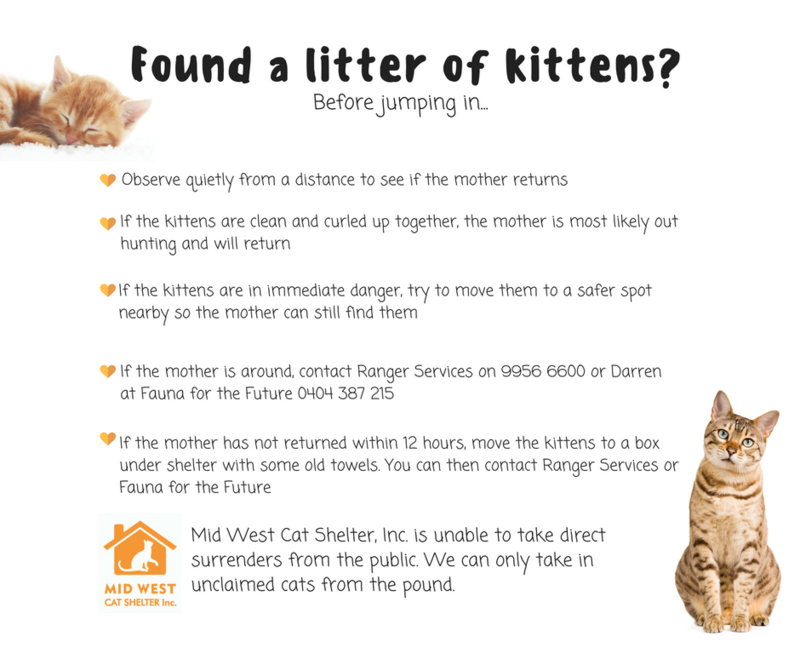 If you find yourself in the situation above, you could try pinning up fliers around your area and even sharing photos and information on Facebook pages such as Everything Animal Geraldton Pet Page. Your next step would be to call the Ranger on 08 9956 6600 between the hours of 6am and 5pm. As mentioned above, unfortunately we cannot take direct surrenders. There are a number of things you can do though! Offer the cat some water and food. Try to handle the cat. If it is friendly, it may belong to a neighbour. You could try door knocking with a photo or description of the cat. Share the information on Facebook pages such as our own Mid West Cat Shelter, Inc, Everything Animal Geraldton Pet Page or Lost and Found Pets Geraldton If the animal appears to be sick or injured, call RSPCA on 1800 CRUELTY (1800 278 589). If all else fails, please contact the Ranger on 9956 6600. The owner will then have the opportunity to locate their pet at the pound, and if not claimed Mid West Cat Shelter, Inc can then assess for rehoming if there is space available. Yes, you can still foster! As you do not register your foster cats in your name like your own pets, you are still able to foster. You can find more information on the new cat laws here and here. Please read our page on Volunteering to get started right away; We’d love to have you join our team of carers! 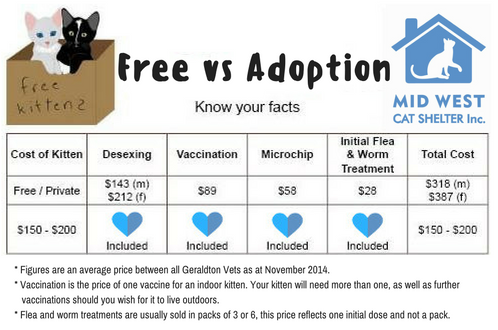 While the kitten may be free it will cost you around $60 to micro-chip and anywhere upwards of $95 to sterilise a male and $160 to sterilise a female cat. Remember, these are legal requirements now for all cats over the age of six months. Add in a worm treatment, flea treatment and vaccinations and it adds up very quickly to a lot more than $200. Our adoption fee is fantastic value and by adopting from us you also get to save a beautiful cat from euthanasia. We give our cats Foster Names because we don’t want the alternative of calling them by their ID number. Our Foster cats are not just numbers to us. It’s a lot easier knowing which cat someone is talking about by name rather than number. Some people change their names when they adopt our cats, some people leave them as they are. I don’t think the cats mind too much; it’s your choice as owner of a new forever friend. Sadly we no longer have a facility where you can come and visit our cats. However, we do have many cats and kittens available to meet in foster homes; just give us a call! Every six months we hold a Super Adoption day at Sanford Veterinary Clinic where anywhere from 12-30 cats and kittens attend looking for their forever homes. 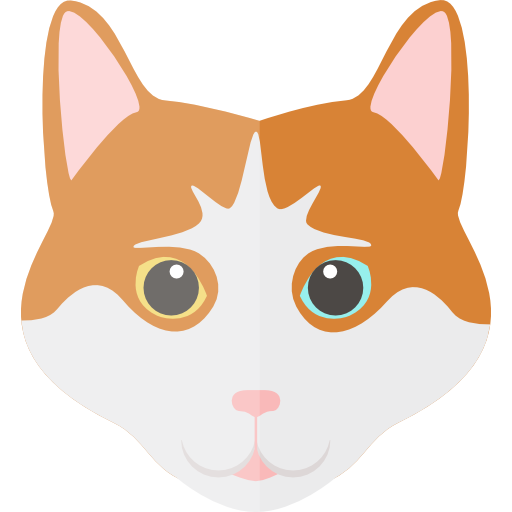 You can find available cat and kitten photos here. Once you have found a furry friend photo that you would like to meet, simply give us a call on 0487193 244 to organise! You can also visit Place Road Pet and Aquarium Centre, which is our exclusive external adoption location! If you send us a photo and information on your cat, we can share it on our Facebook page. You can also post this information on other Facebook pages such as Everything Animal Geraldton Pet Page or Lost and Found Pets Geraldton to help get word out. Don’t forget to also check the City of Greater Geraldton Pound website daily as photos of all impounded animals are uploaded here.